Former VICE SQUAD drummer and now Vive Le Rock contributor Shane Baldwin teams up with Bristol Archive Records founder Mike Darby to share stories of the city’s punk scene during the 70s and 80s. A founder member of Vice Squad in 1978, Baldwin was also a co-founder of the Riot City label, one of the major players on the UK82 scene, releasing product by ABRASIVE WHEELS, VARUKERS and fellow Bristolians CHAOS UK and CHAOTIC DISCHORD. Now a contributor to a number of publications, Shane’s book Last Rockers: The Vice Squad Story was published earlier this year. He’s currently writing a new book on the Bristol punk scene. Bristol Archive Records showcases music from the diverse Bristol punk and reggae scene from 1979 onwards, many of whom are still active today. 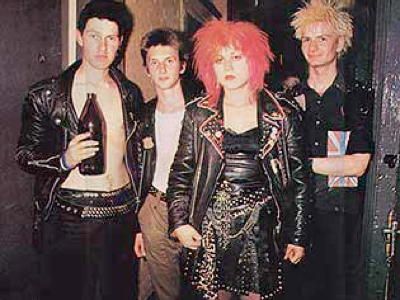 Their extensive archive documents the city’s punk scene through rare photographs, posters, gig listings, label and band discographies, gig and release reviews and stories from people active in the scene. The discussion, chaired by noted writer, lecturer and musician Dr Peter Webb, takes place at Arnolfini, Bristol at 5pm-6pm on Saturday 30 July. Tickets for the discussion are available here. The discussion will be followed by a gig featuring Chaos UK, BLURT and RITA LYNCH. Tickets available here. ‹ MORE BANDS FOR PUNK BOWLING WEEKENDER!